The Vesta Liquid Fuel Fireplace is a wall mount contemporary fireplace that encourages creativity. The elliptically curved steel surface is constructed of high-grade polished stainless steel allowing for the flames to exhibit the most enchanting reflections and is beautiful to the eye both with or without a fire. This liquid fuel fireplace utilizes clean-burning natural ethanol based fuel. There is no need for additional ventilation, chimney or flue because the fuel does not smoke or soot. Use this fireplace in any home, office or commercial space! Pureflame® Ethanol Fireplaces combine unique design and a high-quality finish to create the visual beauty and warmth of a real fire in any setting whether indoors or out. Powered by Purefuels, a premium wholly renewable biofuel, the energy supplied goes straight into the room instead of being lost through the chimney therefore maximizing efficiency indoors. Pureflame biofuel fireplaces need no fixed installation and are fully mobile while the flames natural yellow and orange provide unparalleled design flexibility in contrast to a conventional fireplace. Pureflame fireplaces spread a moderate and pleasant warmth right from the start and in contrast to wood-burning there is nothing to clean once the fire is gone. 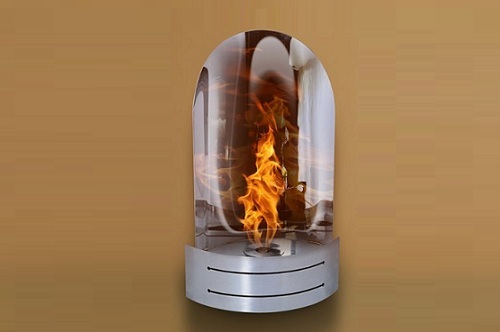 When the burner is cool it can be refilled and used again lighting a fireplace has never been more comfortable and easy.